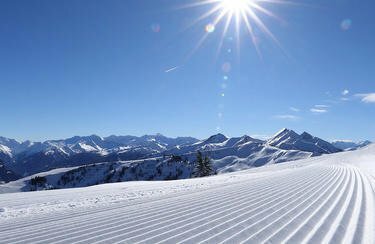 The ski rental of INTERSPORT Lackner, mountain station Panoramabahn offers modern facilities of latest technology: Next to a fully automatic machine for professional all-round-service for ski and snowboard, the Montana Waxjet cares for smooth surfaces. Anyone who wants to rent his equipment, saves valuable time by the electronic check-in. Rent your ski equipment at INTERSPORT Lackner, mountain station Panoramabahn and enjoy lots of benefits: The ski rental in Großarl has the latest ski, snowboards, and fun equipment in store, that can be tested thoroughly at any time, exchanged or, of course, purchased . Basic, Economy, Premium or Superior? The INTERSPORT Rent team knows what´s important and helps you in choosing the appropriate ski and snowboard models. The amazing extra for freezing woman´s feet: Rent ladies boots with free boots warmer! Get FREE information for your holiday in Großarl to your mobile!